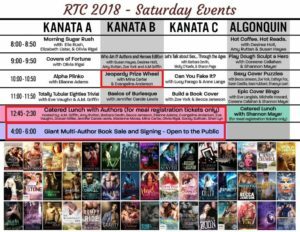 I will be attending Romancing the Capital (RTC) 2018 in Ottawa, Canada from August 2 -4 which is an event organized by Eve Langlais. While main event tickets for this event are sold out, you can join the event’s Facebook group to be informed if anyone is looking to sell theirs. If you can’t get one of those, then you are still in luck, because the book signing on August 4th from 4 – 6 pm is open to the public. At the book signing, I will have a select number of printed books available on a first come, first serve basis. If you are coming to the event and want to make sure I have a specific book, then today is the last day to use my pre-order form to make sure I bring that book for you. 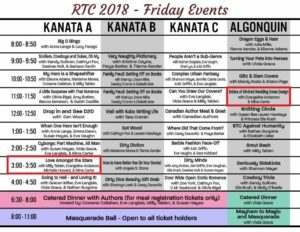 This will be my first time at RTC, and I am excited to meet everyone. At the book signing, I will have a select number of printed books available on a first come, first serve basis. If you are coming to the event and want to make sure I have a specific book, then today is the last day to use my pre-order form to make sure I bring that book for you.